After the large directly heated tube in last months tube presentation, let's have a look at a tube on the other end of the size spectrum. For this month I selected the Western Electric 417A. 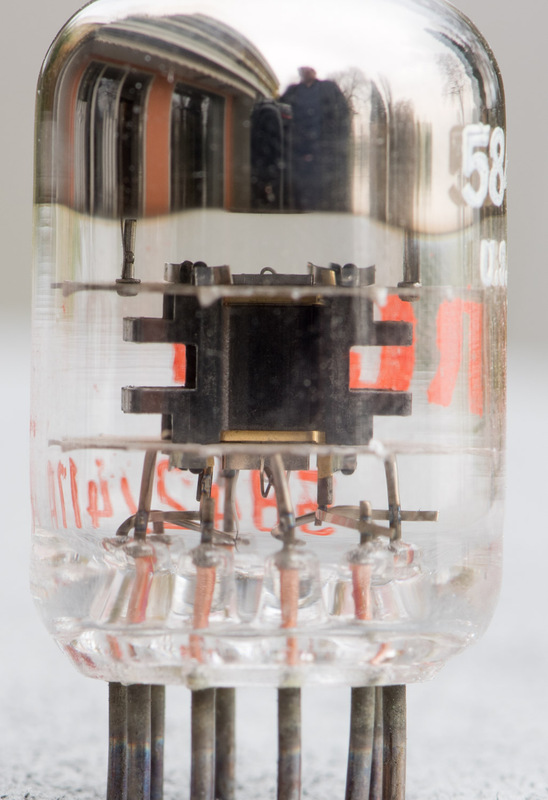 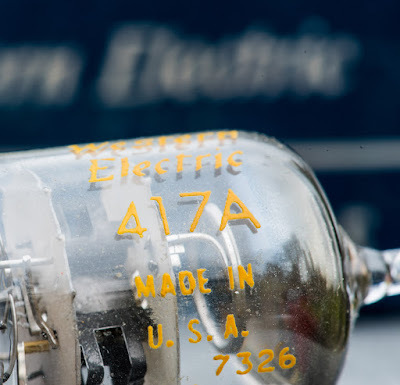 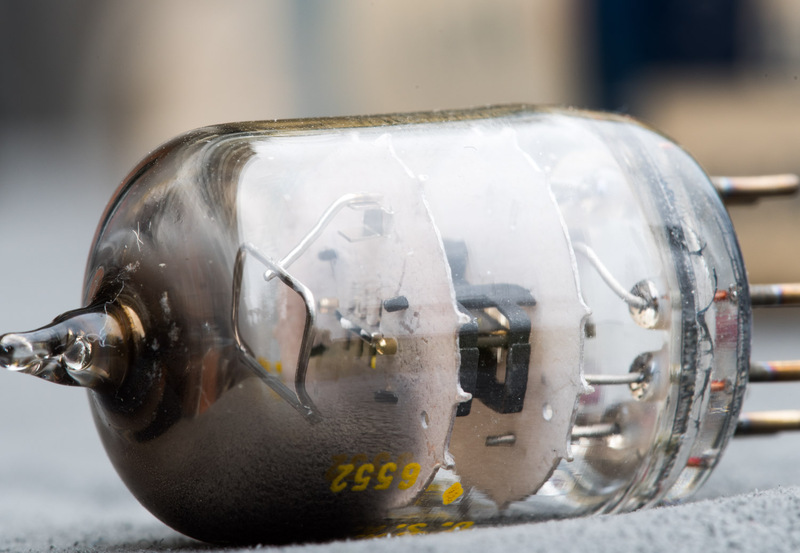 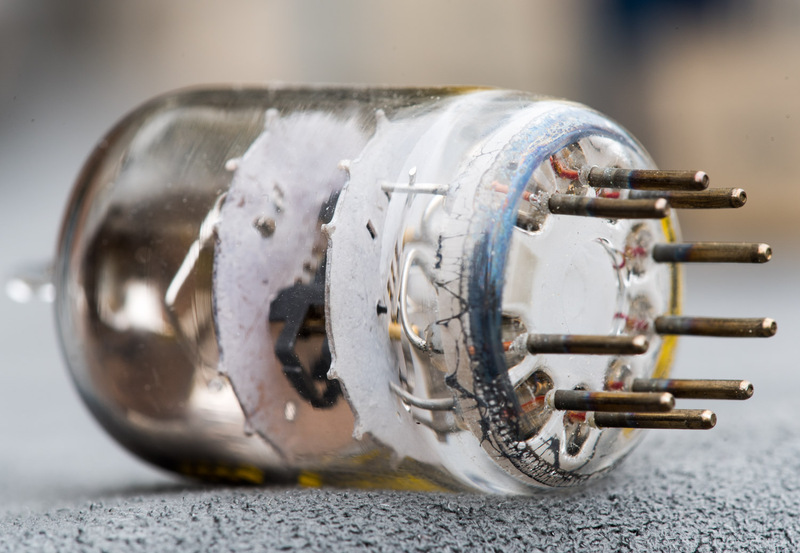 The 417A is a rather modern tube intended for grounded grid operation in broad band amplifiers. 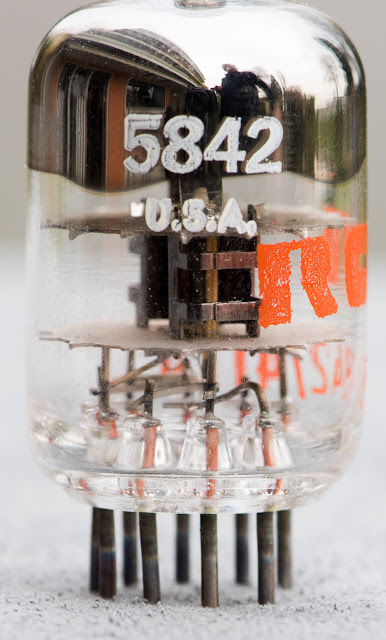 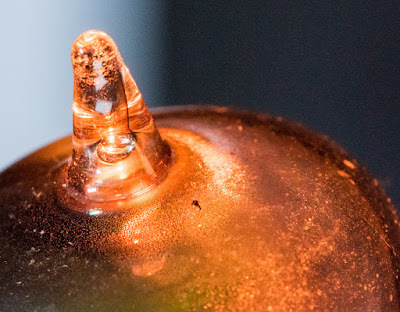 The tube comes in a tiny glass bottle on a 9 pin miniature (Noval) base. The pinout can be seen on the left. 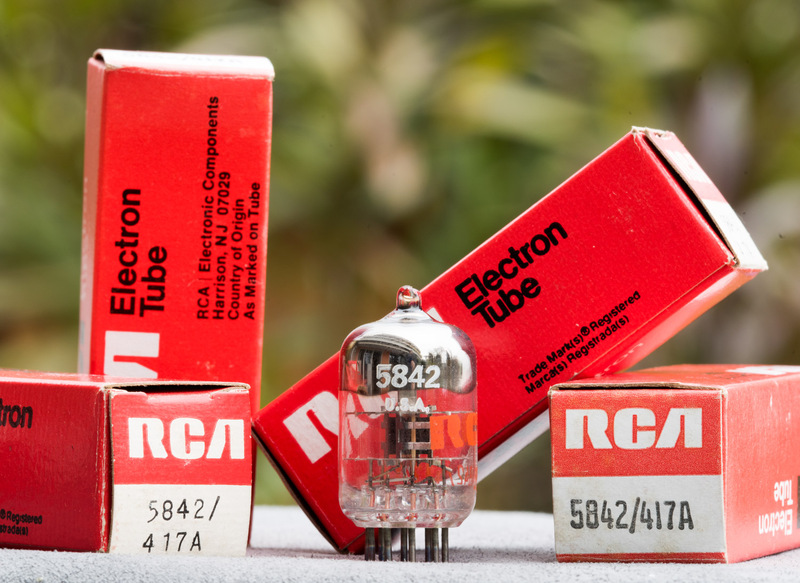 The diameter is a bit over 20mm which is typical for most Noval tubes. 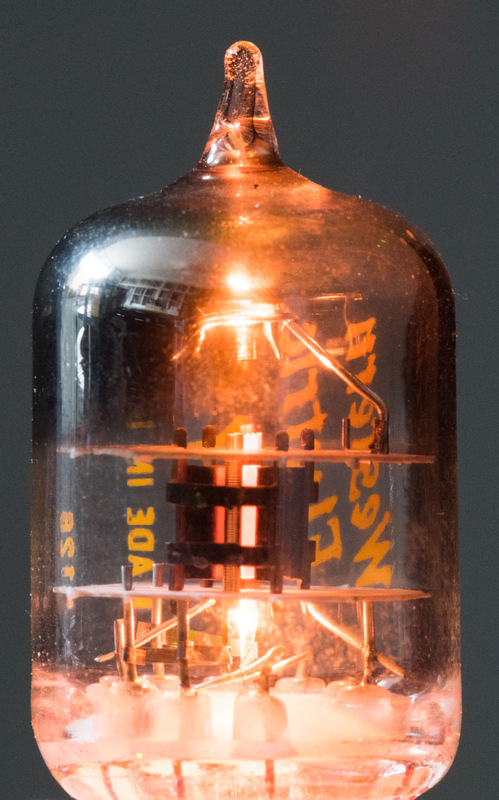 But it is only about 35mm high. Which gives it a distinctive look similar to the 6AM4. The applications it was intended for required high transconductance tubes and the 417A has plenty of that: 25.000 micromhos or 25mS. 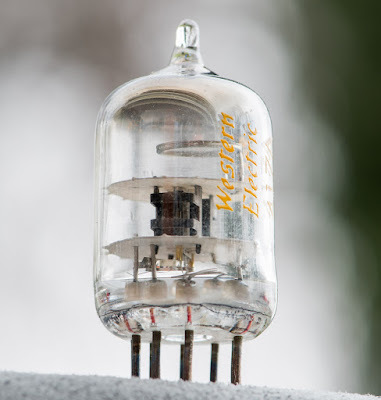 This comes with an amplification factor of 43 and a plate resistance of 1700 Ohms. The plate voltage maximum is specified with a rather low 200V which however is quite typical for such tubes. 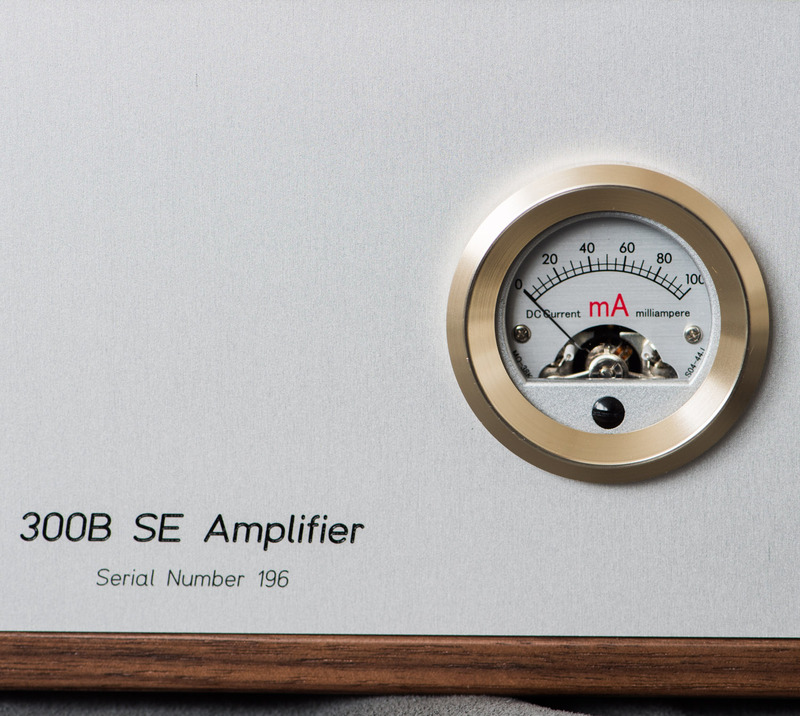 The maximum plate current is 40mA. 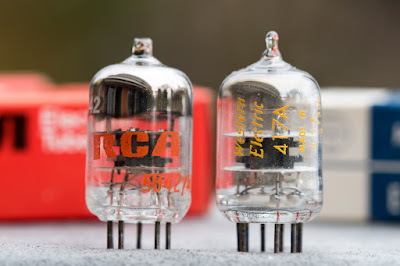 However these should not be at the limits at the same time. 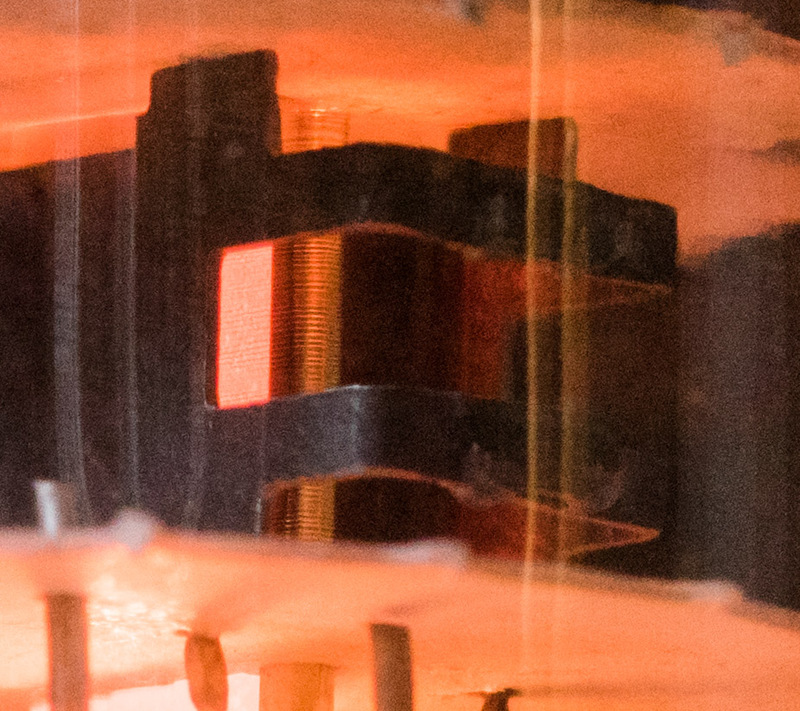 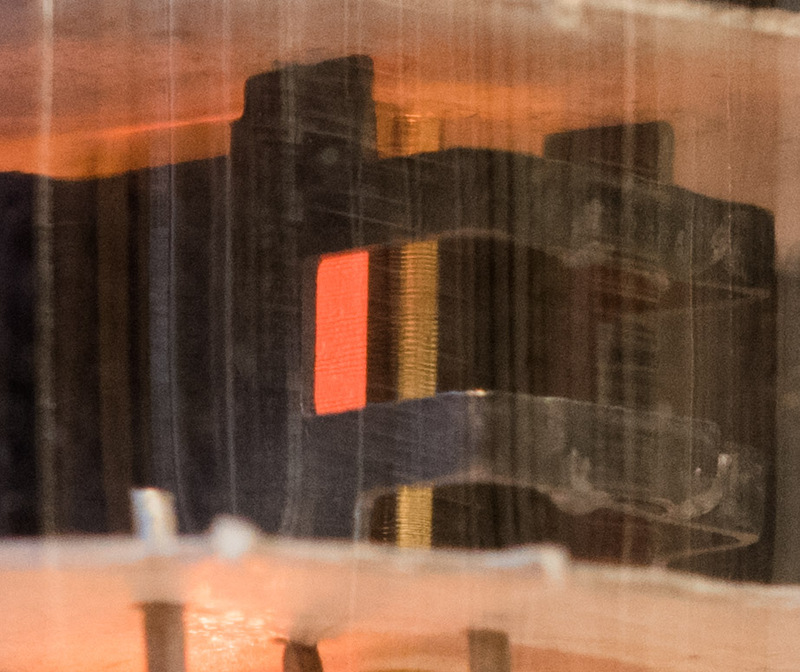 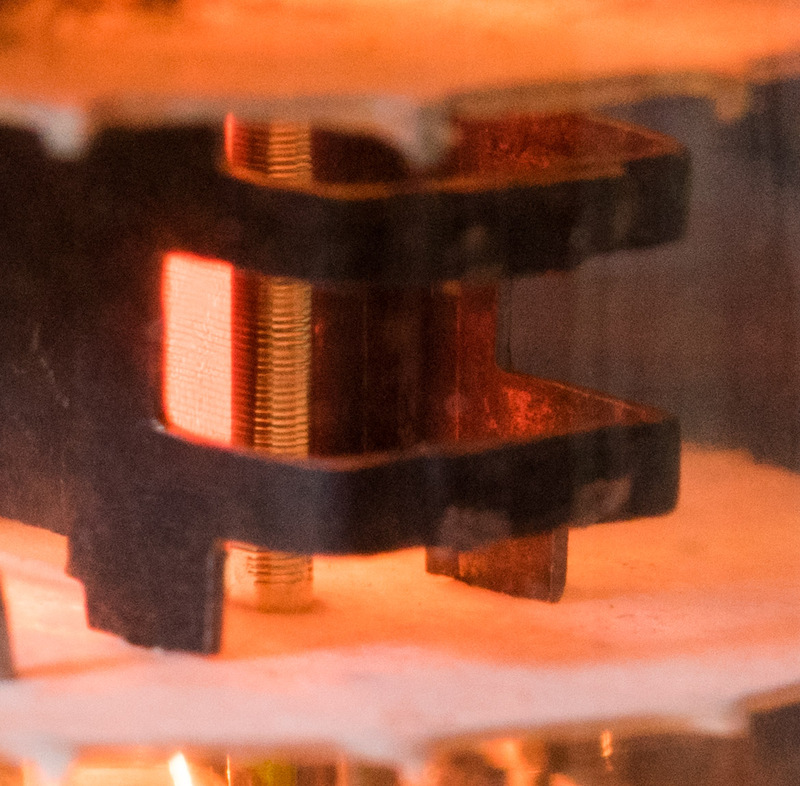 The plate dissipation is 4.5 Watts max. 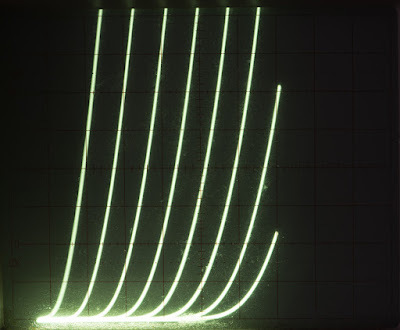 Typical operation as given in the data sheet is 150V and 22.5 mA. 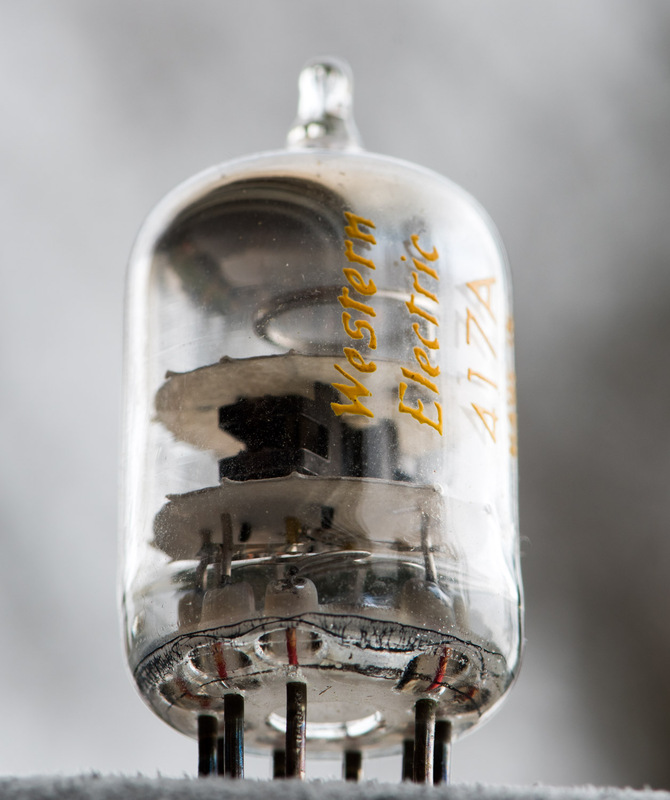 Although intended for grounded grid operation, the tube can also be used in other configurations which are more common in audio. It was started to be used among audio amplifier builders in the 1990ies. 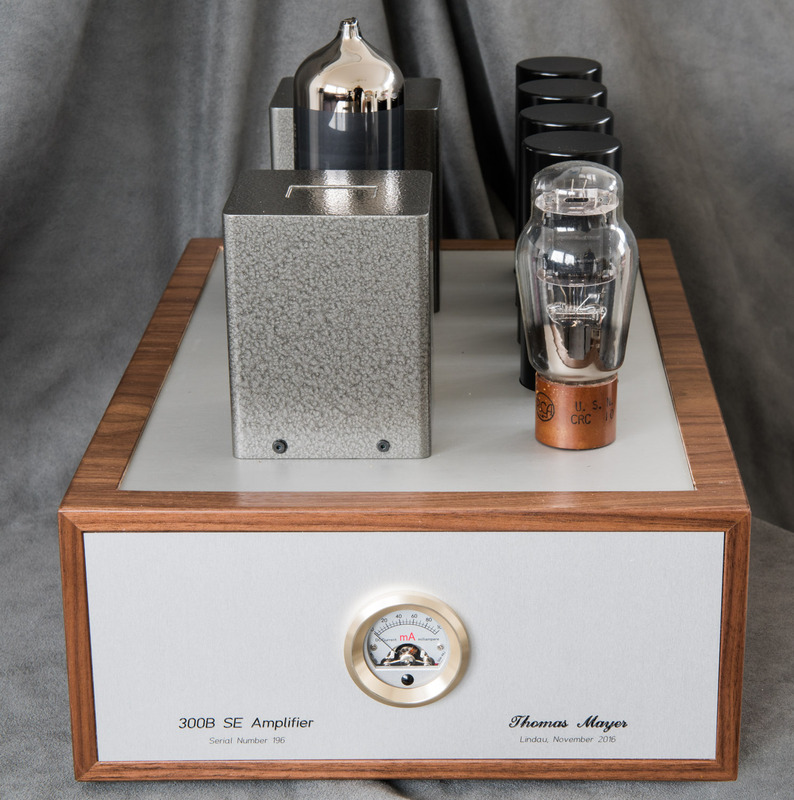 A famous example is a phono stage by Arthur Loesch which used the 417A in the first stage. 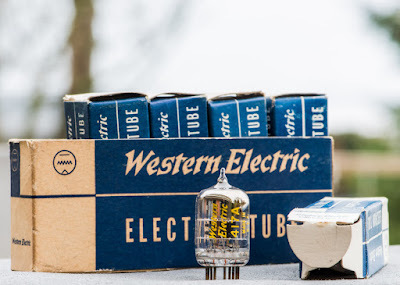 When transformer coupled driver stages in single ended power amps became fashionable the tube often was selected as driver for a 300B. The rather high amplification factor coupled with a low plate resistance seems to make it well usable and enables a two stage power amp. 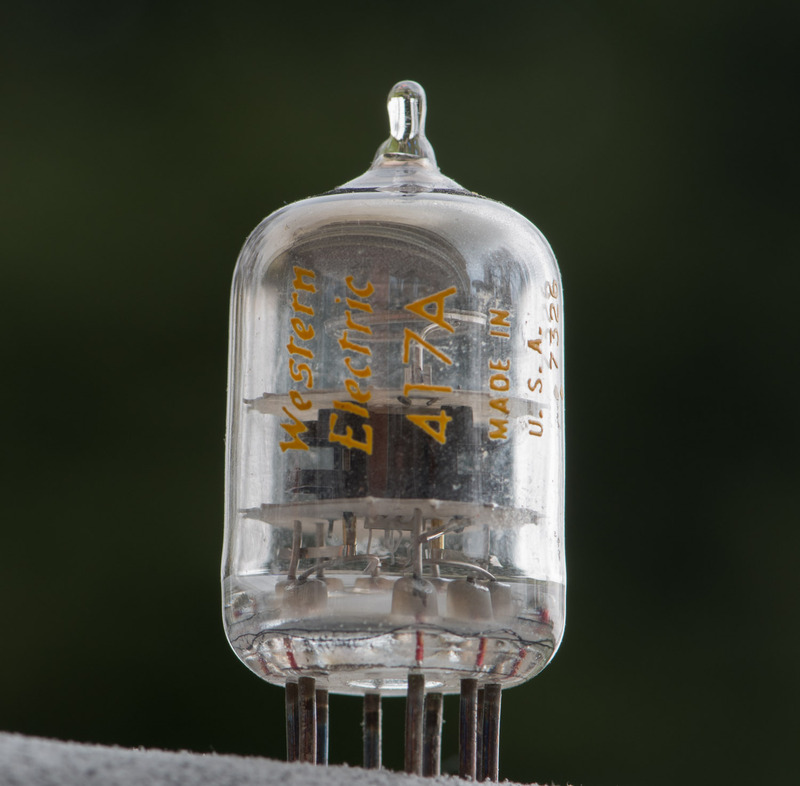 However to my taste the 417A does not provide enough headroom as driver for an output tube. 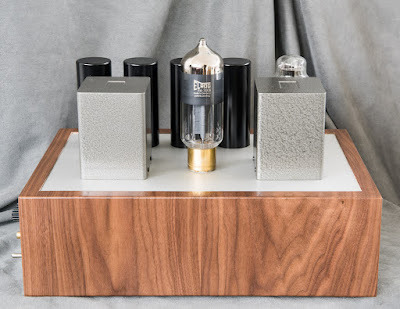 I see it's primary use as a phono stage tube. 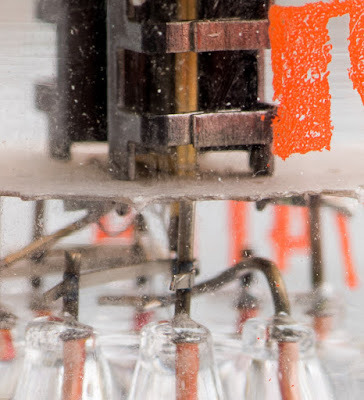 The high transconductance promises low noise operation. 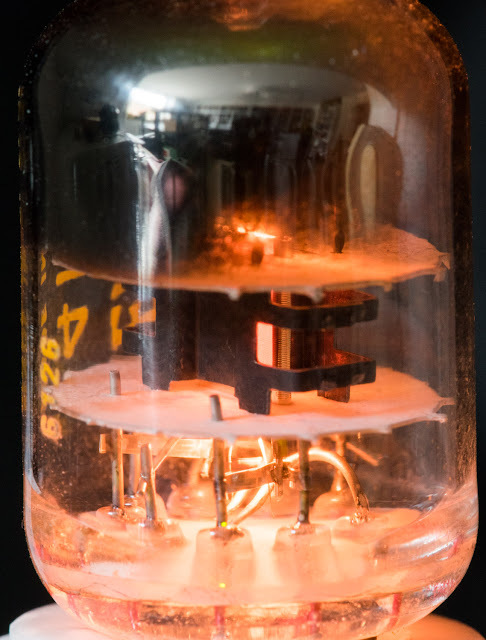 However it also makes the tube difficult to use since it tends to break into self excited oscillations. 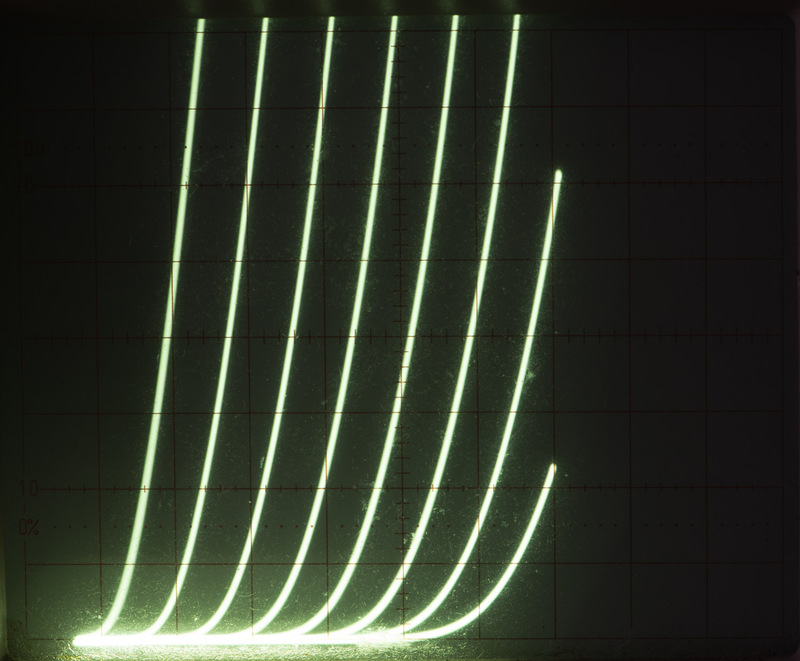 Careful layout and other measures are required to prevent such oscillations. Quite often these can manifest as audible noise or microphonics although the self oscillations themselves are at very high frequencies far outside the audio band. 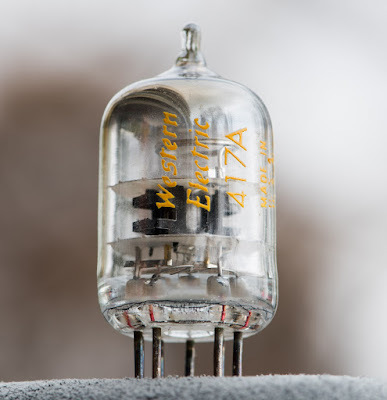 Probably because of that the tube got a bad reputation for being microphonic and seems to have lost popularity. 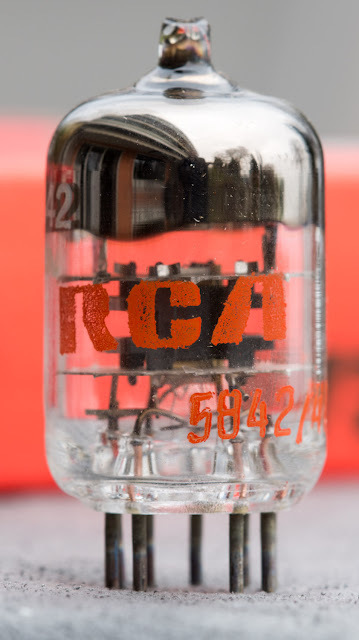 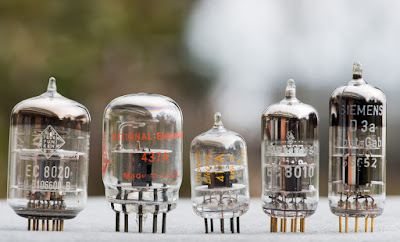 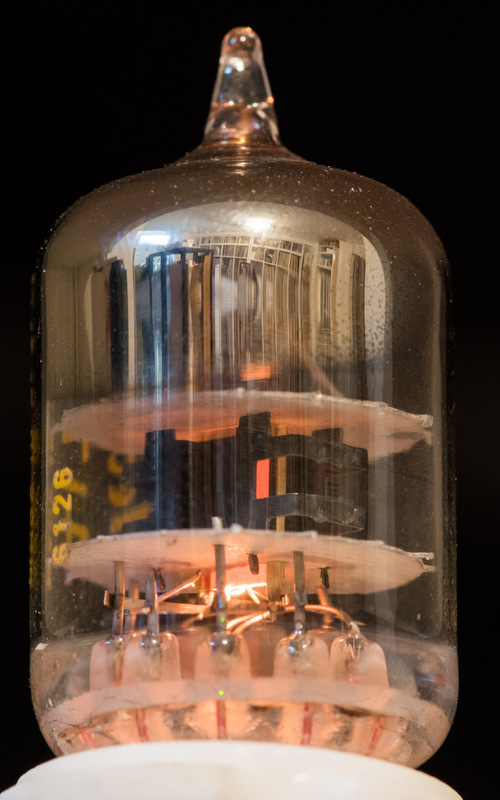 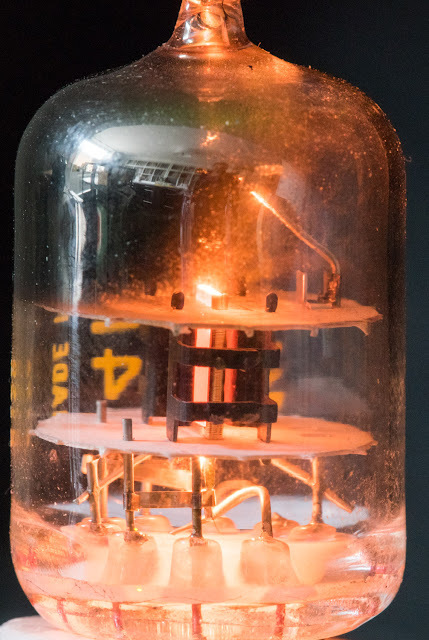 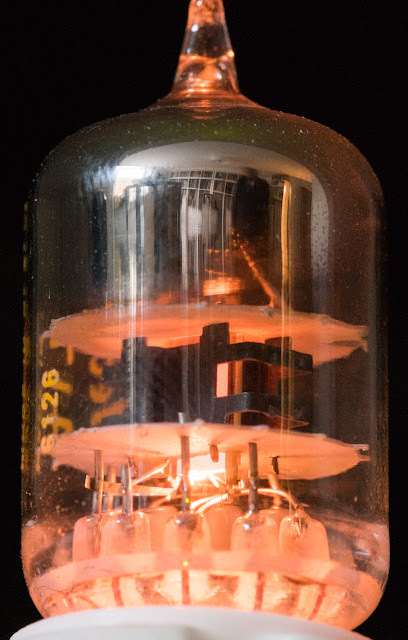 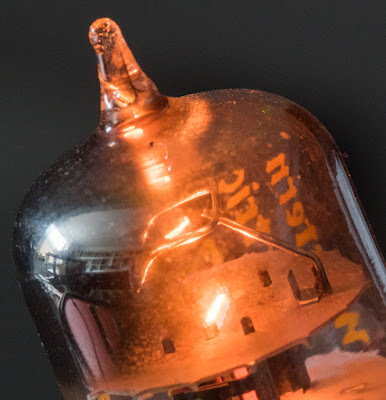 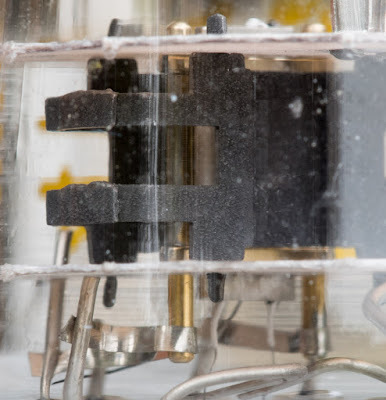 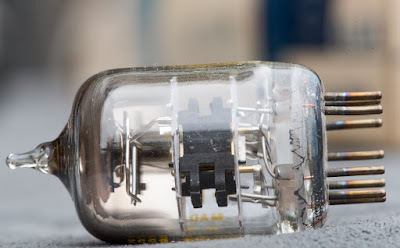 It is quite interesting how some tube types go through cycles of being discovered by amplifier builders then overly hyped and finally almost forgotten and rarely seen anymore. 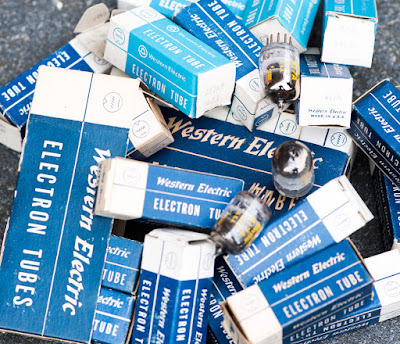 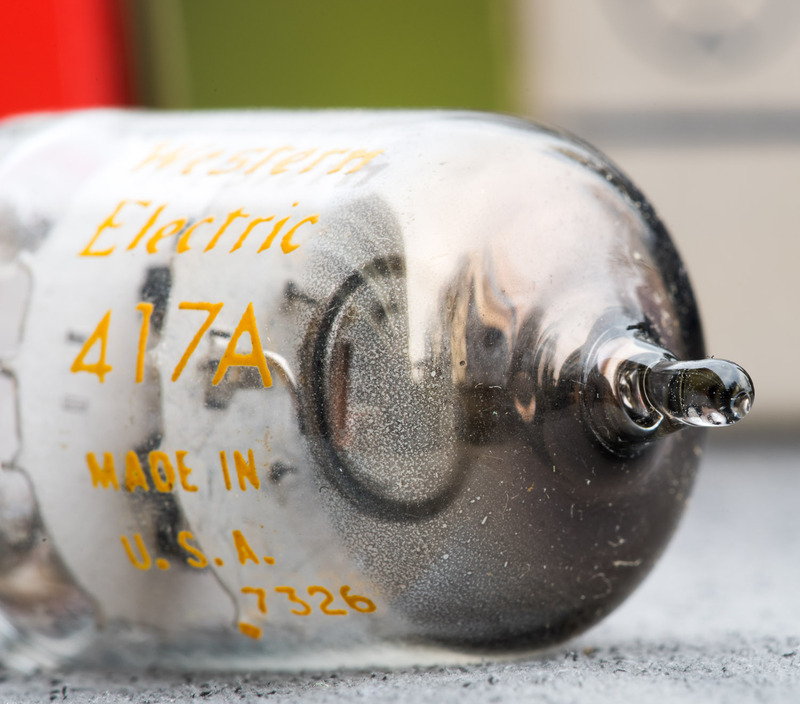 Despite the crazy hype around Western Electric and every product baring that name, NOS WE 417A tubes can still be found at tube dealers. 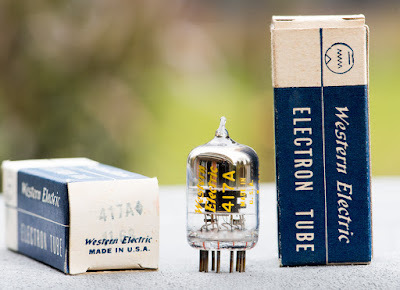 Not exactly cheap but given the specs and brand name still reasonable. The 417A was also made by other manufacturers, for example Raytheon and RCA who gave it a standard industrial designation, 5842. 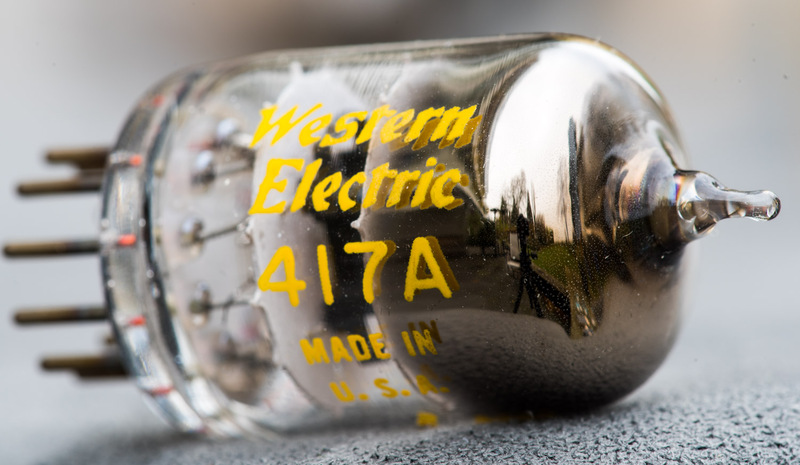 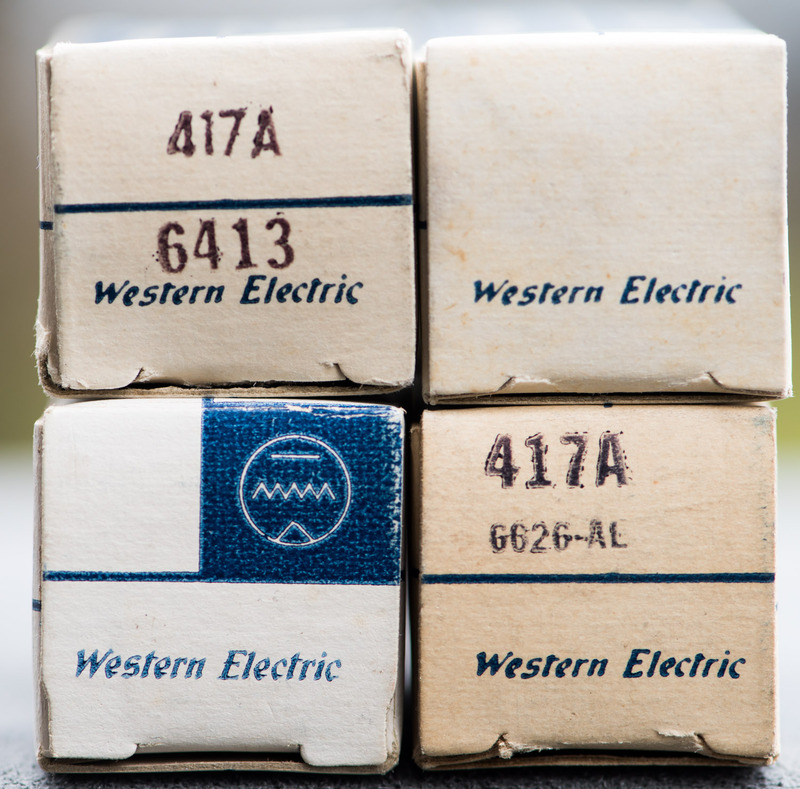 Let's have a look at the original made by Western Electric. 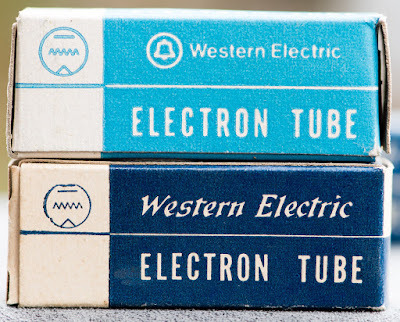 The tube comes in the typical blue and white WE boxes, which changed a bit through the years. 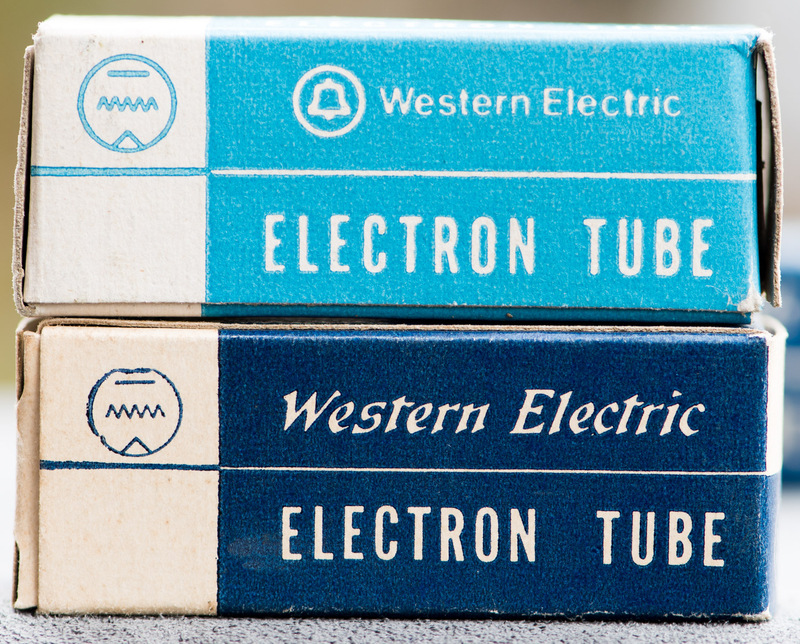 The tube looks great with the manufacturer name and type in the bright yellow lettering. 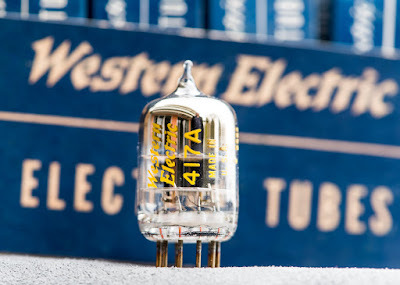 This tiny tube is a true gem. With double designation 5842 / 417A. 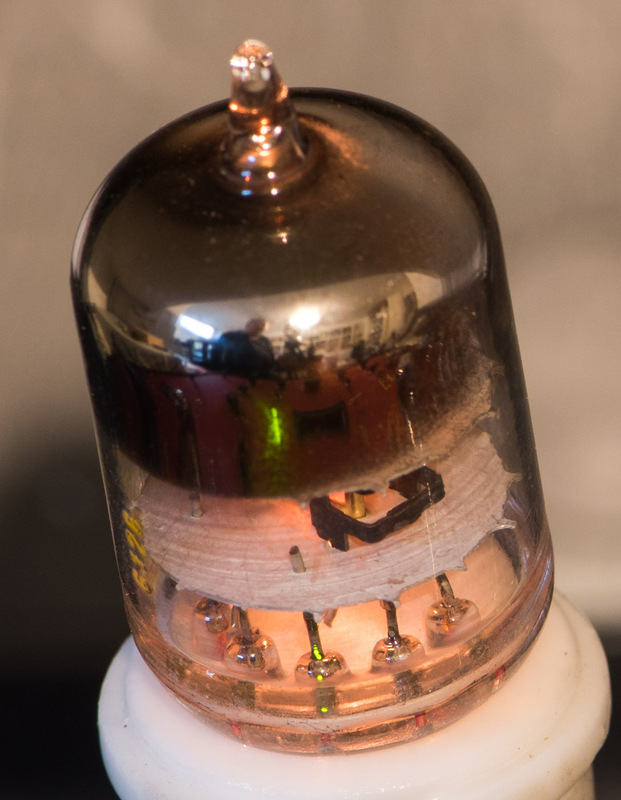 Now let's see how the tube looks with the heater lit up. 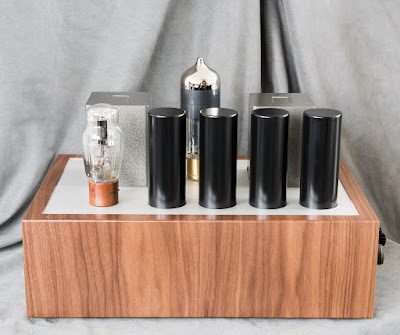 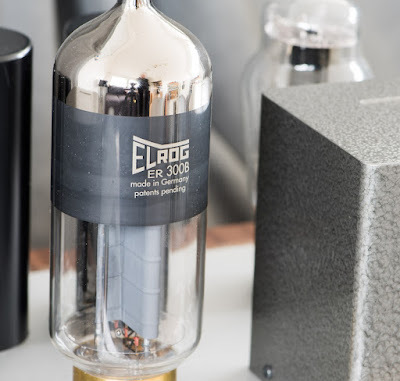 A beautiful tube with interesting specs. The tiny WE417A in the middle. A EC8010 to the right next to a D3a. Then the bigger sister, the 437A on the left besides the undisputed high transconductance drama queen, the EC8020. The last time I used the 417A is probably almost 20 years ago in some experimental phono stage. In which I remember it performing very well. 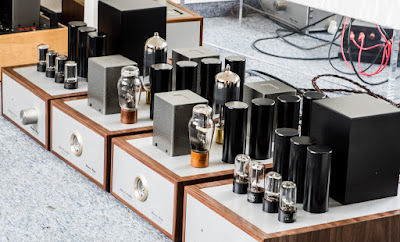 Just finished another set of 300B monos with 10Y driver. 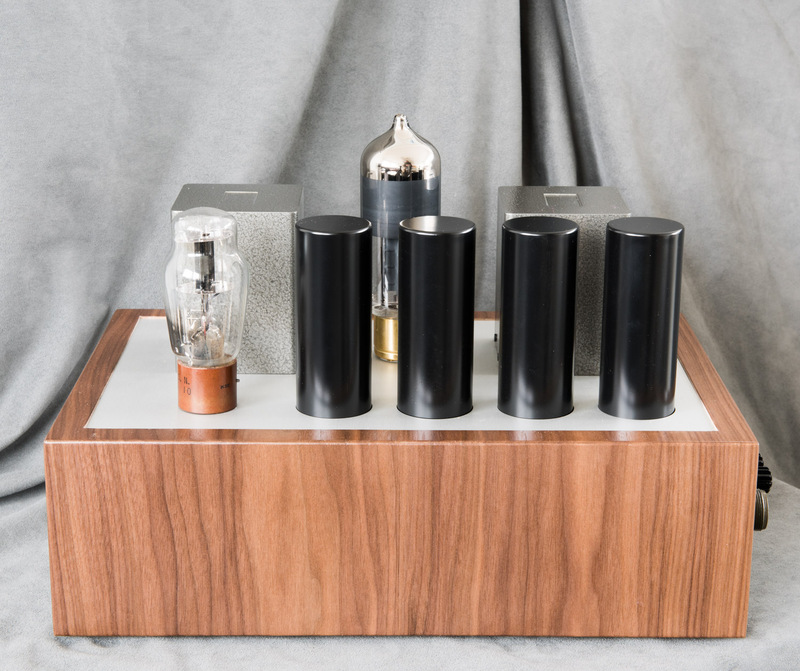 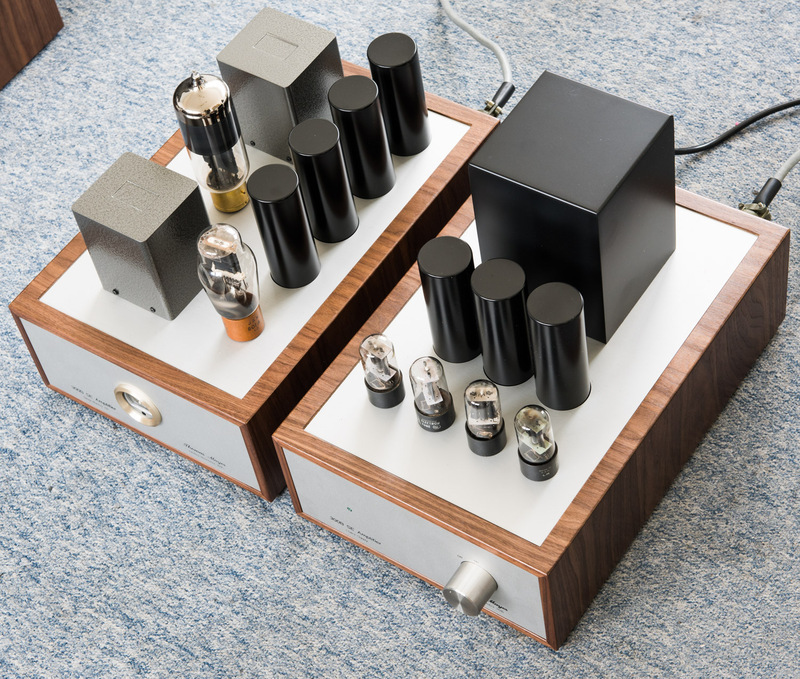 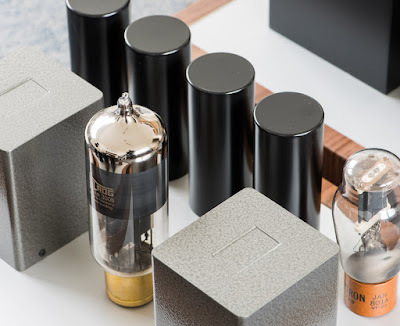 Each mono block consists of the amp and a separate power supply. 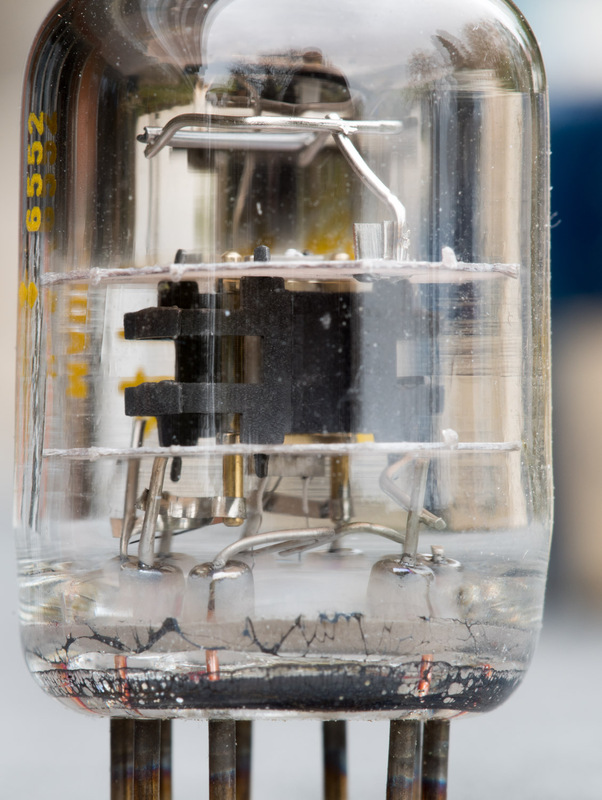 Tango interstage and output transformers. Of course with the ELROG ER300B as output tube. Yamamoto meter at the front to show the bias current of the output tube.